Robert B. Srygley et al. El Niño, Host Plant Growth, and Migratory Butterfly Abundance in a Changing Climate. Biotropica. In the wet forests of Panama, El Niño typically brings a more prolonged and severe dry season. Interestingly, many trees and lianas that comprise the wet forests increase their productivity as a response to El Niño. Here, we quantify the abundance of migrating Marpesia chironbutterflies over 17 yr and the production of new leaves of their hostplants over 9 yr to test the generality of the El Niño migration syndrome,i.e., whether increased abundance of migrating insects and productivity of their food plants are associated with El Niño and La Niña events. We find that the quantity of M. chiron migrating across the Panama Canal was directly proportional to the sea surface temperature (SST) anomaly of the Pacific Ocean, which characterizes El Niño and La Niña events. 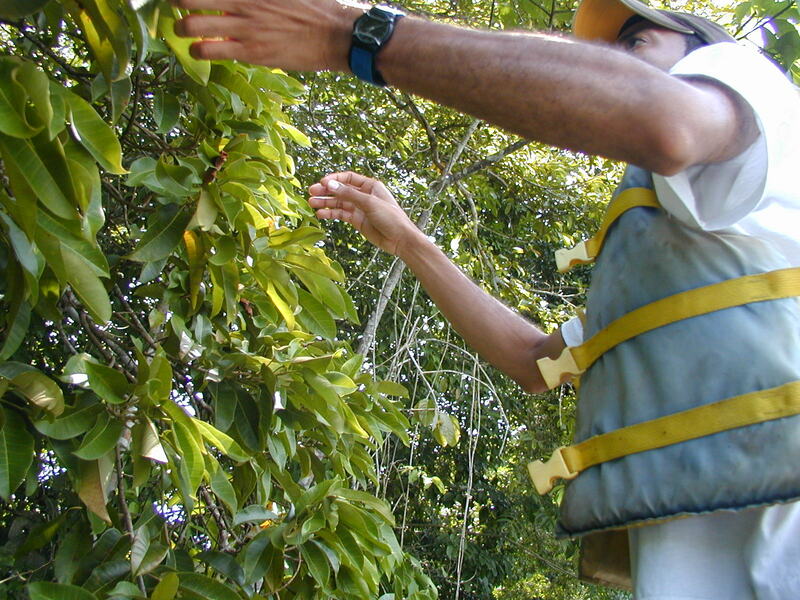 We also find that production of new leaves by its larval host trees, namely Brosimum alicastrum, Artocarpus altilis, and Ficus citrifolia, was directly proportional to the SST anomaly, with greater leaf flushing occurring during the period of the annual butterfly migration that followed an El Niño event. 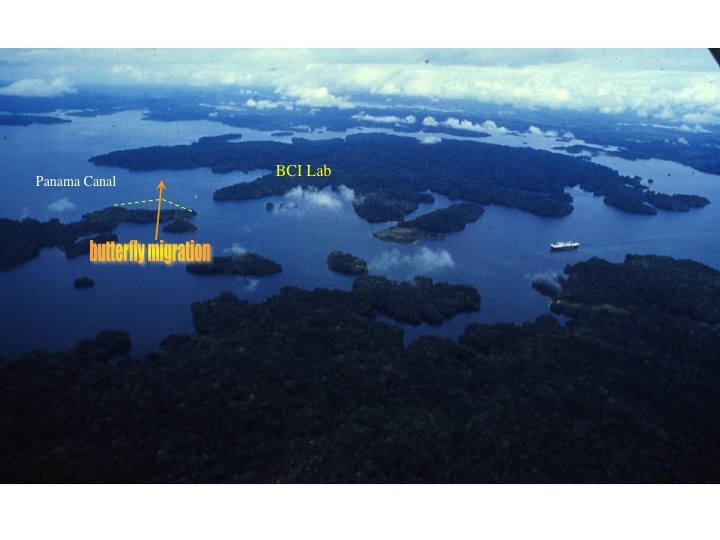 Combining these and our previously published results for the migratory butterfly Aphrissa statira and its host lianas, we conclude that dry season rainfall and photosynthetically active radiation can serve as primary drivers of larval food production and insect population outbreaks in Neotropical wet forests, with drier years resulting in enhanced plant productivity and herbivore abundance. Insect populations should closely track changes in both frequency and amplitude of the El Niño Southern Oscillation with climate change. This is the study site in in Barro Colorado Nature Monument. As you can see it is dominated by water, making access by boats essential. Study site in Barro Colorado Nature Monument. 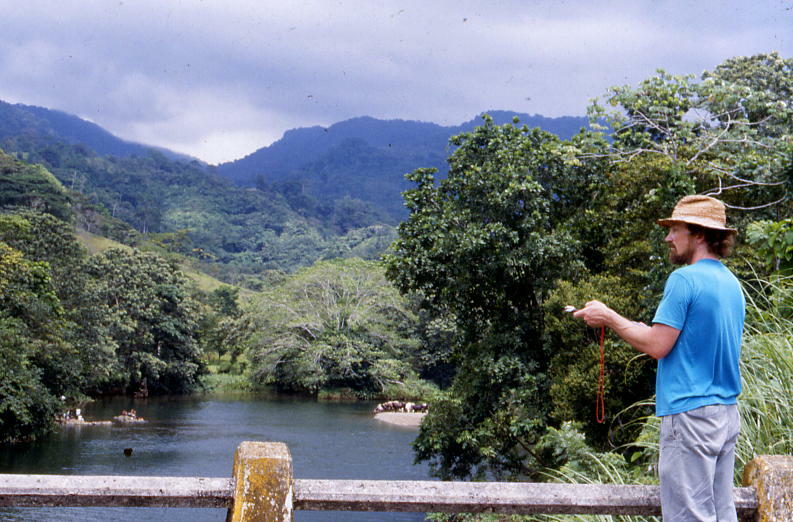 The lead author taking vanishing bearings of migrating butterflies at Rio Guanche on the Atlantic coast of Panama. Composite of four frames from a high speed video of Marpesia chiron flying across the Panama Canal. Assistant Alejandro Almanza checking a hostplant for eggs and larvae.